In the previous module we saw how keywords can be linked to controlled vocabularies through reconciliation. However, this practice only works when someone already attached keywords to a resource. Large-scale digitization efforts are currently producing digital resources at a massive scale which do not have keywords attached to them. Traditional manual cataloging practices can’t keep up with this pace, so we have to think about how to use algorithms which can gold mine for semantics within non-structured texts. Companies such as Tagasauris for example are integrating machine learning for visual recognition and micro-tasks outsourced via Amazon’s Mechanical Turk to provide metadata in a cheap and quick manner for the media industry. Franco Moretti has been the leading scholar to elaborate the notion of distant reading. His book Maps, graphs and trees gives an excellent introduction to the topic of using statistics to analyze very large volumes of non-structured text and how the outcomes can help to answer new types of research questions from the humanities. What can you experiment with as a librarian? 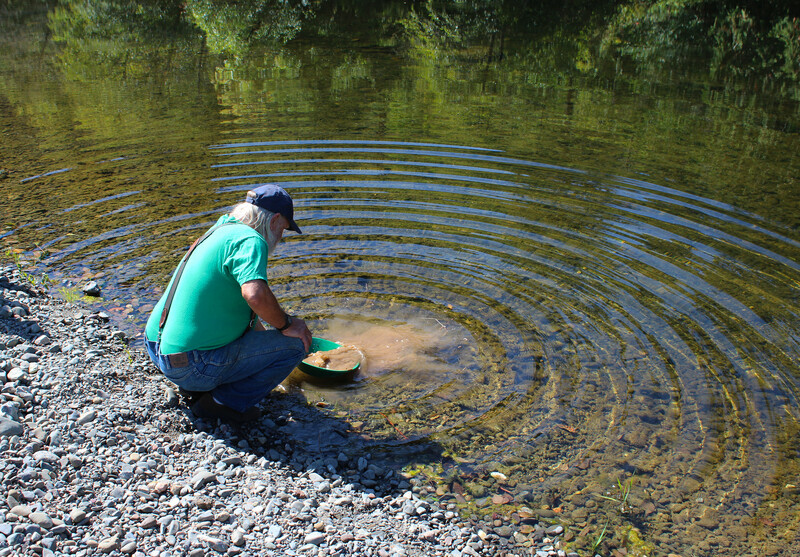 Both methods can be used with a minimum of resources and technical experience. This module gives you the opportunity to experiment on your own! Topic modeling allows us to step back from individual documents and look at larger patterns among all the documents, to practice not close but distant reading. 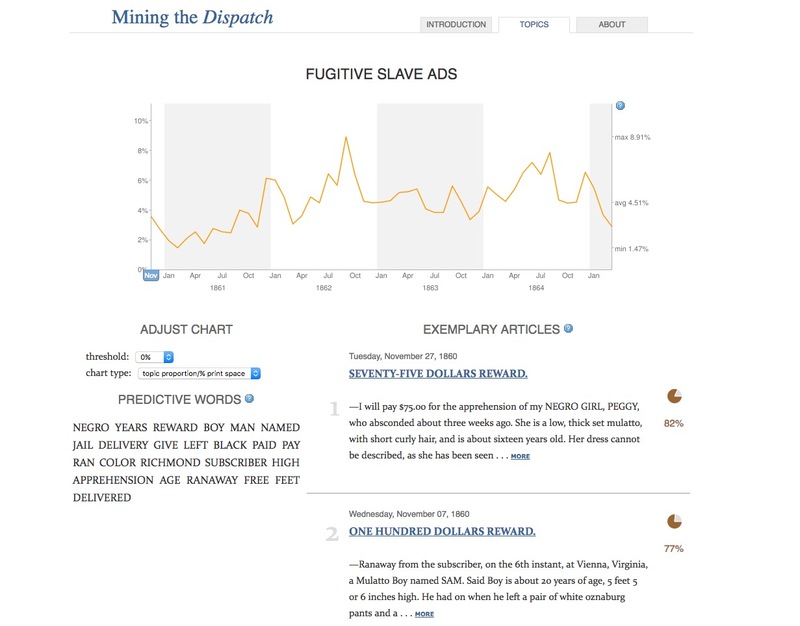 Topic modeling provides historians an additional method that allows us to examine and detect patterns within not a sampling but in the entirety of an archive. The DH team at Notre Dame University embedded Distant Reading options within the OPAC of its library. When consulting the digitized monographs, readers can either read page per page of the scans, or rely on various information extraction methods to get a quick overview of the most common names, places and terms appearing in the book. Here we’ve clicked on the term Congo, which leads then to various links from Wikipedia giving more information about Congo. 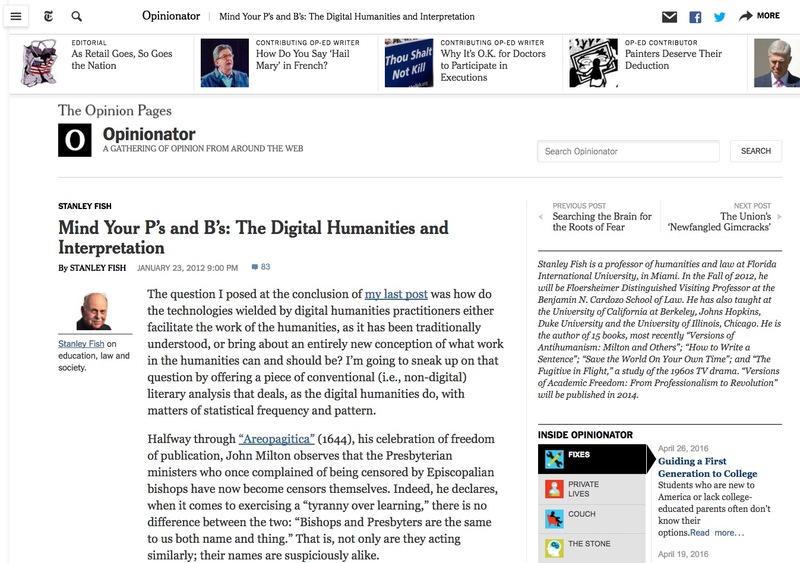 At the hight of the DH hype, Stanley Fish published a widely read opinion piece in the New York Times, in which he heavily criticized the tool-driven approach from the DH: DH run the numbers, and then see if they prompt an interpretive hypothesis. The method, if it can be called that, is dictated by the capability of the tool . In order to be aware of both the possibilities and limits of these methods and tools, the following slides will introduce two approaches towards automated metadata creation with which you can experiment on your own. Consider the sentence: On 25 September 2006, we visited Washington to see the White House. Washington: the state, the city, the jazz musician, etc? However, recall that a URL serves the double purpose of identification and location. What is actually identified by https://en.wikipedia.org/wiki/Jeff_Koons? Wikipedia page about Jeff Koons? But which version? Wikipedia is constantly edited, so one would have to use http://en.wikipedia.org/w/index.php?title=Jeff_Koons&oldid=569081712 in order to refer to a specific version. The same URL cannot be used to also identify the person. Another URL could identify him—but not locate him, as we can not represent an individual electronically. Do URLs identify only electronic resources or also real-world objects? A Wikipedia article about Jeff Koons is clearly an information resource, as it can be represented in electronic form. Its URL can be used to identify, locate and access an electronic representation of it. We can represent a document about Jeff Koons, but this would be a different resource than the artist himself, as they have different properties (e.g. date of creation). 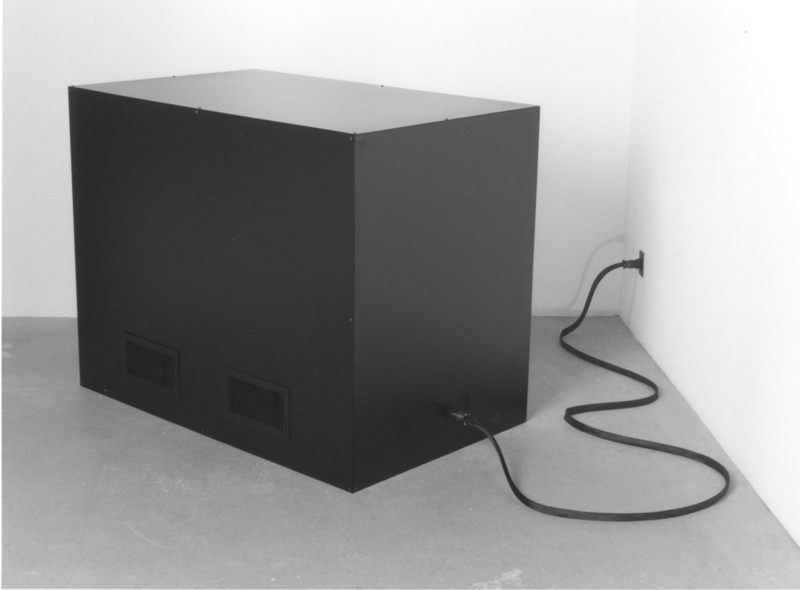 The artist is therefore a non-information resource. When Jeff Koons is mentioned in the document, the first URL will be used. Furthermore, if we visit the first URL in the browser, DBpedia is not able to represent Jeff Koons, so it redirects you towards the page about Jeff Koons instead. 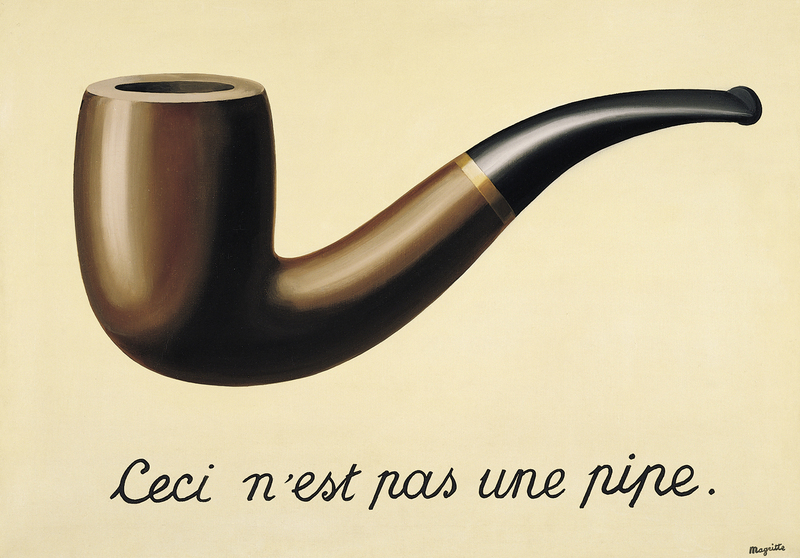 What do you see: a pipe or a representation of a pipe? We can use this iconic image of René Magritte to talk about the dreaded HTTP Range-14 issue, in which the Web community debates on whether a URL should be understood as a reference to a document or a resource. Since one URL can only identify a single resource, a concept and its describing document(s) should necessarily have different identifiers. However, implementing this conceptual difference on the Web is difficult. The results sent back by NER services underline the semantic mine field we are still facing with this issue. NER services, especially the commercial services, remain very much black boxes: we throw content at them and they send back URLs with entities. From a LIS perspective, it’s essential to know how to evaluate the quality of these services. How to represent the entity Library of Congress? Services can refer to recognised knowledge bases, already well-integrated as Linked Data, will refer to for example http://dbpedia.org/page/Library_of_Congress. Commercial services sometimes create custom URLs which are hardly used outside their service. OpenCalais for example mints its own PermID, which represents the LoC as https://permid.org/1-5037352201. Services often refer to documentation about a resource, such as the DBPedia page which represents all sorts of information about for example the LoC: http://dbpedia.org/page/Library_of_Congress. However, services such as Zemanta potentially identify the LoC with https://www.loc.gov/ from where one has immediate access to their services. You will need to install the NER extension first. Download the extension from our website. 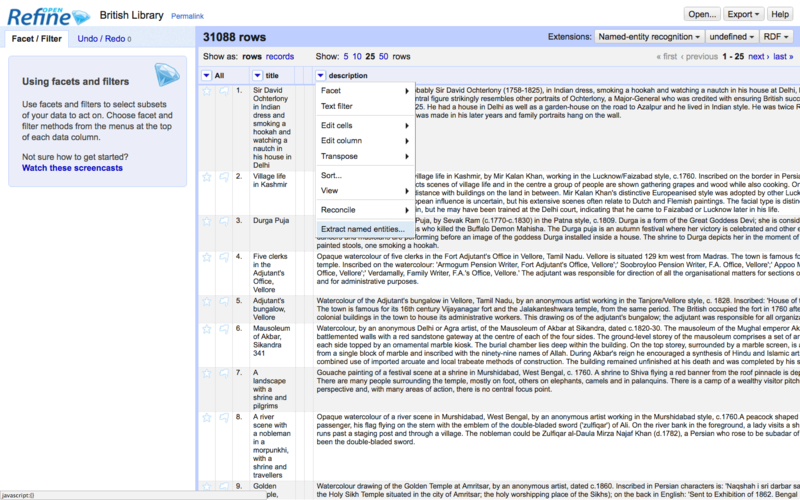 We will use the metadata of the British Library to demonstrate NER in OpenRefine. 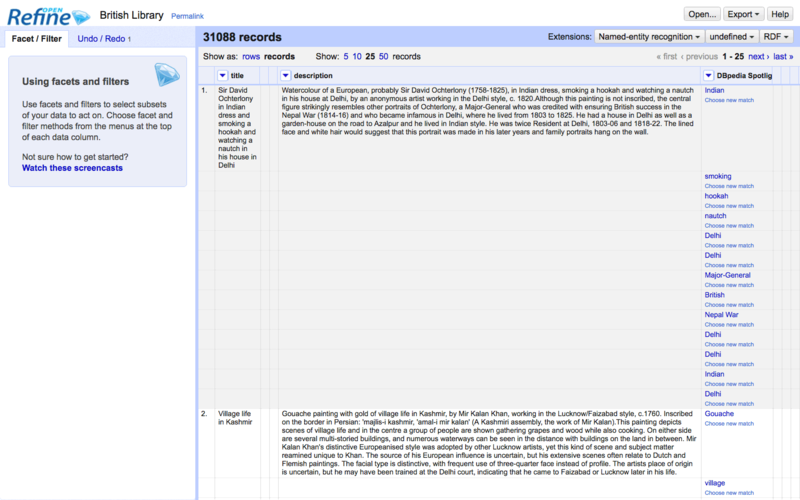 Create a project with the British Library dataset. By default, DBpedia Spotlight is enabled. Other services might require an API key. First, identify the relevant column. In contrast to reconciliation, for NER, fields with a lot of text are the best candidates. Then, choose the services and start enriching. Click a column triangle and choose Extract named entities. Pick the services you want and choose Start extracting. Extracted entities are displayed in a new column. The algorithm is constrained by the words used in the text; if Freudian psychoanalysis is your thing, and you feed the algorithm a transcription of your dream of bear-fights and big caves, the algorithm will tell you nothing about your father and your mother; it’ll only tell you things about bears and caves. It’s all text and no subtext. This screencast gives an in-depth overview of all the pre-processing steps needed to apply LDA, one of the most popular specific approaches within the TM family by using the Wikipedia corpus. …refers to the possibility to automatically create abstracts of books. No, the concept refers to a generic approach of using quantitative methods to deal with large volumes of data and does not represent one specific method or technique. …implies we no longer need to actually read texts. No, distant and close reading practices complement one another and are not mutually exclusive. …can be helpful to librarians. Yes! Automated methods such as TM or NER can be applied to extract metadata from large corpora and create navigational paths for end-users. What makes NER so interesting as an information extraction technique? 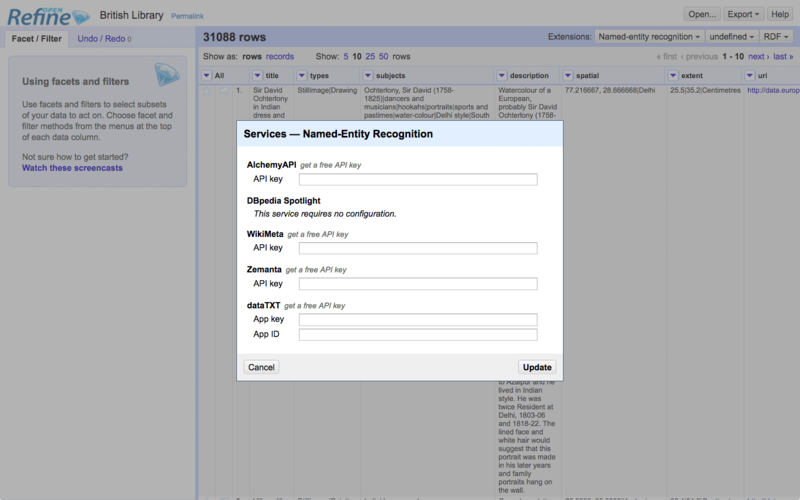 Entities are identified by a URL. Yes! The URL allows to disambiguate and to obtain information about the entity. 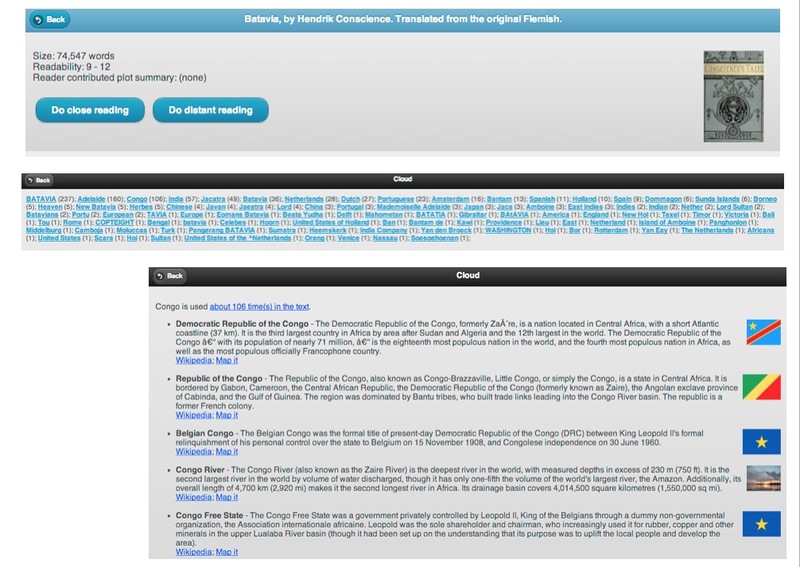 It allows to perform sentiment analysis on feedback by patrons. No! Sentiment analysis uses other techniques. You can parse ambiguous dates to an ISO standardized data format. No! Certain scripts can do that, but they have nothing to do with NER. Why is it important to distinguish information and non-information resources on the Web? Yes! For example, a Web page about a person (information resource) has a different creation date than the date of creation of the actual individual (non-information resource), which would be his or her date of birth. It is actually not so important. It is really important! If not it becomes really difficult to refer to actual objects, people, ideas etc on the Web. It has an important impact on the design of URLs. Yes, the URL needs to allow differentiating between the actual thing and documentation about the thing. When is Topic Modeling relevant for librarians? 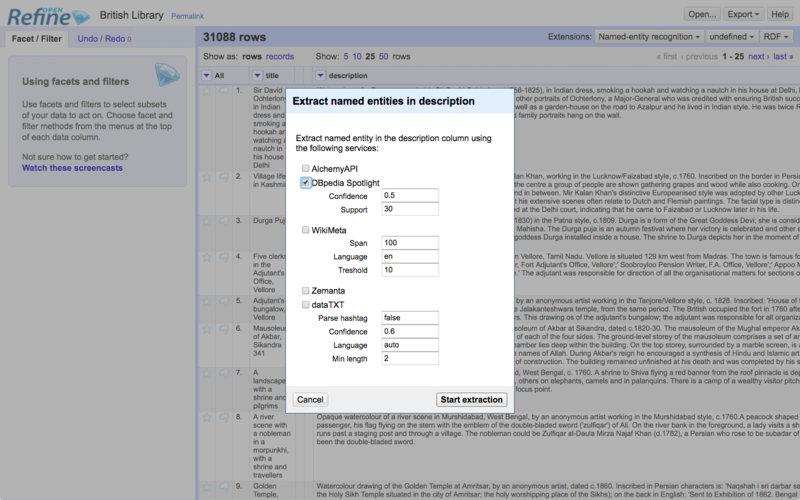 To extract key terms from metadata fields such as description. No, TM requires a substantial volume of text and does not work for a couple of paragraphs. When you want to create an overview of recurring themes in a collection of scanned literature. Yes, this would potentially be a good application for TM. When you want to identify all place names from a corpus. No! NER is the application you need for this type of task.